So I took a little trip to Chicago this past weekend. Before I say anything else, let it be known that I am a small town girl. I live on a farm outside of our tiny college town. The biggest city I have ever been to is Ann Arbor. Which is not that big. So, can anyone say culture shock? That's right. 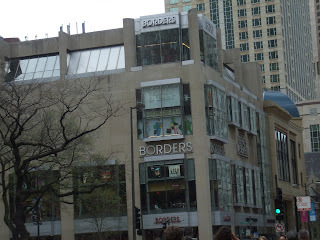 A Borders. That was FOUR STORIES TALL! Now, if that makes me sound like a hick, I don't care. This was the biggest bookstore I had ever been inside of, and I made sure to visit every inch of it before settling down in the young adult section, where my friend Lisa found April's Book of the Month! Besides finding the Comeback Season, we also found copies of How to be Bad by E. Lockhart, Lauren Myracle, and Sarah Mlynowski, which isn't due to hit stores until Tuesday! (Click here to read my review). 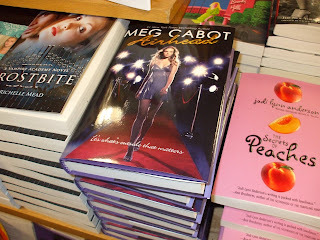 And not only that, but there was also TONS of copies of Airhead! I loved this book, but I promised the publicist who gave it to me not to post my review until the official release date, May 13, so you'll have to wait til then, or just go to the big huge Borders in Chicago and buy yourself a copy! The ride home left me plenty of time to read and catch up on some really stellar reads, so stay tuned for some new book reviews heading this way soon! I've been to my fair share of Borders but not a 4 story one! Wow! Yeah we have Airhead in our local borders too, I never realized that books pop up in stores before their actual release date, can't say the same for dvds! A four story Borders and a stack of How to Be Bad? I'm jealous... :) Thanks for sharing. Ha, that was a fun weekend. I almost got The Book of Lost Things, but then I decided not to. Yeah, so that was random- great pics BTW. 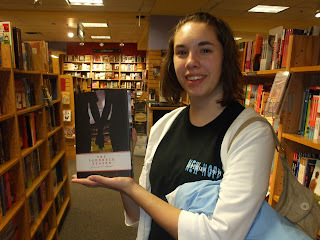 Have You Seen the Cover of Breaking Dawn Yet? Wanna Win an Airhead Tee? Guest Blogger: Alexa Young, Author of Frenemies! May Book(s) of the Month!